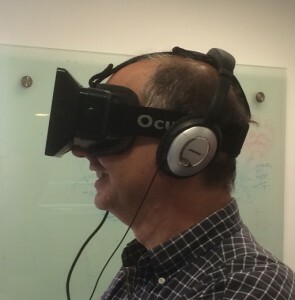 At the Tel Aviv headquarters of the Center for Educational Technology, an NGO I’m very fond of because of its simultaneous dedication to improving education and its embrace of innovative technology, I got to try an Oculus Rift. They put me on a virtual roller coaster. My real knees went weak. Earlier, I gave a talk at the Israeli Wikimedia conference. I was reminded — not that I actually need reminding — how much I like being around Wikipedians. And what an improbable work of art is Wikipedia. I’m at the Israeli Wikimedia conference. The chair of the Wikimedia Foundation, Jan-Bart De Vreede, is being interviewed by Shizaf Rafaeli. Jan introduces himself. Besides being the chair, in the Netherlands he works on open educational resources at Kinnesnent. He says that the Wikimedia Foundation is quite small compared to other organizations like it. Five members are elected by the community (anyone with enough edits can vote), there are four appointed members, and Jimmy Wales. Q: The Foundation is based on volunteers, and it has a budget. 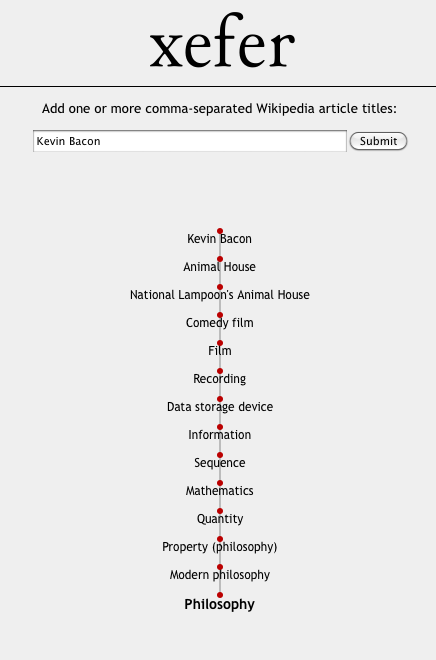 What are the components of the future for Wikipedia? A: We have to make sure we get the technology to the place where we’re prepared for the future. And how we can enable the volunteers to do whatever they want to achieve our mission of being the sum of all knowledge, which is a high bar? Enabling volunteers is the highest impact thing that we can do. Q: Students just did a presentation here based on the idea that Wikipedia already has too much information. A: It’s not up to us to decide how the info is consumed. We should make sure that the data is available to be presented any way people want to. We are moving toward WikiData: structured data and the relationship among that data. How can we make it easier for people to add data to WikiData without necessarily requiring people to edit pages? How can we enable people to tag data? Can we use that to learn what people find relevant? A: WikiData. Then Wikipedia Zero, making WP access available in developing parts of the globe. We’re asking telecoms to provide free access to Wikipedia on mobile phones. Q: You’re talking with the Israeli Minister of Education tomorrow. About what? A: We have a project of Wikipedia for children, written by children. Children can have an educational experience — e.g., interview a Holocaust survivor — and share it so all benefit from it. A: Wiki Monuments [link ?]. Wiki Air. So many ideas. So much more to do. The visual editor will help people make edits. But we also have to make sure that new editors are welcomed and are treated kindly. Someone once told Jan that she “just helps new editors,” and he replied that that scale smuch better than creating your own edits. Q: Books feel trustworthy. The Net automatically brings a measure of distrust, and rightly so. Wikipedia over the years has come to feel trustworthy, but that requires lots of people looking at it and fixing it when its wrong. Q: 15,000 Europeans have applied to have their history erased on Google. The Israeli Supreme Court has made a judgment along the same lines. What’s Wikipedia’s stance on this? A: As we understand it, the right to be forgotten applies to search engines, not to source articles about you. Encyclopedia articles are about what’s public. Q: How much does the neutral point of view count? A: It’s the most important thing, along with being written by volunteers. Some Silicon Valley types have refused to contributed money because, they say, we have a business model that we choose not to use: advertising. We decided it’d be more important to get many small contributions than corrode NPOV by taking money. A: How about paid editing so that we get more content? Q: It’s a tricky thing. There are public and governmental institutions that pay employees to provide Open Access content to Wikipedia and Wiki Commons. On the other hand, there are organizations that take money to remove negative information about their clients. We have to make sure that there’s a way to protect the work of genuine volunteers from this. But even when we make a policy about, the local Wikipedia units can override it. Q: What did you think of our recent survey? A: The Arab population was much more interested in editing Wikipedia than the Israeli population. How do you enable that? It didn’t surprise me that women are more interested in editing. We have to work against our systemic bias. Q: Other diversity dimensions we should pay more attention to? A: Our concept of encyclopedia itself is very Western. Our idea of citations is very Western and academic. Many cultures have oral citations. Wikipedia doesn’t know how to work with that. How can we accommodate knowledge that’s been passed down through generations? Q: Wikipedia doesn’t allow original research. Shouldn’t there be an open access magazine for new scientific research? A: There are a lot of OA efforts. If more are needed, they should start with volunteers. Q: Academics and Wikipedia have a touchy relationship. Wikipedia has won that battle. Isn’t it time to gear up for the next battle, i.e., creating open access journals? A: There are others doing this. You can always upload and publish articles, if you want [at Wiki Commons?]. Jimmy Wales has proposed that Wikipedia might black out its English-language pages for a short period to register opposition to the SOPA law that would allow the US government to shut down access to sites that provide access to material that infringes copyright. These shutdowns would occur without the need for any judicial procedure, without notice, and without appeal. I think Jimmy’s idea is great and that all sites that could be affected by SOPA — which is to say any site — ought to join in. Just name the date and time, and many of us would turn out our sites’ lights. I just shared a cab with James Bridle, a UK publisher and digital activist (my designation, not his) who is the brilliance behind the printing out of the changes to the Wikipedia article on the Iraq War. It turns out that those changes — just the changed portions — fill up twelve volumes.